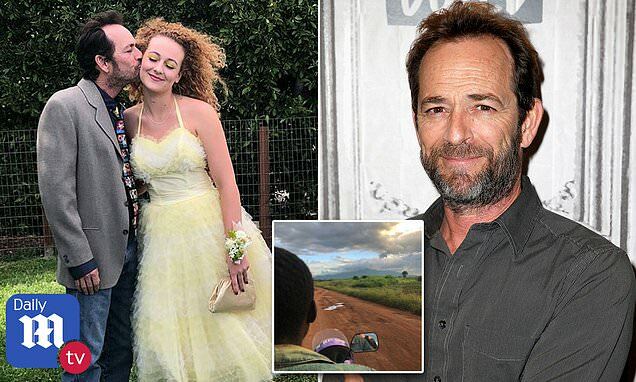 Luke Perry's daughter cut short a charity trip to Africa and rushed home to be by her ailing father's side in his final hours. The star's 18-year-old daughter, Sophie, abruptly ended her six-month trip doing charity work in Malawi and came home as soon as she learned her father had a stroke last Wednesday. The distraught teen arrived just in time to join her brother, mother, wider family and friends by Perry's bedside before the Beverly Hills 90210 star passed away on Monday morning. Just hours before her 52-year-old father suffered the stroke that led to his death, Sophie posted a picture of a dirt road in Malawi where she had been doing charity work. 'It’s been a month and Malawi has gifted me with so so much joy, beauty, and malaria. Wouldn’t trade it,' she wrote in her Instagram post on Wednesday. A day before Perry's hospitalization, his 21-year-old son Jack posted a photo to his Instagram promoting his upcoming wrestling match, which was set for last Friday. Perry had been seen in recent years cheering on his son and taking photos of him at matches. In September Sophie, who lived in Dowagiac, Michigan, posted a video describing her charity work for non-profit One World Center, and asked for fundraising help for her trip. 'I'm in a group of eight people, seven of us are going to Africa and one of us is going to Brazil,' she said.